This was a really interesting one. I mentioned the lack of officially-appointed moderators in the previous post, right? So, Ed Greenwood appointed me moderator. What? I don’t know what I’m doing … so the audiences I have most experience dealing with are kids … I’ll just assume the same techniques can keep a panel going …. Well, we all survived. My faithful friend who trailed after me throughout the whole con said this one was the most fun from the uninvolved spectator’s point of view. Ed Greenwood certainly kept things lively. “Seriously?” The cover art panel — lots of fun. This was definitely the panel on which the participants laughed the most. We wandered down a few tangentially-related byways, too, into a shared enthusiasm for the original Nancy Drew stories, among other things. 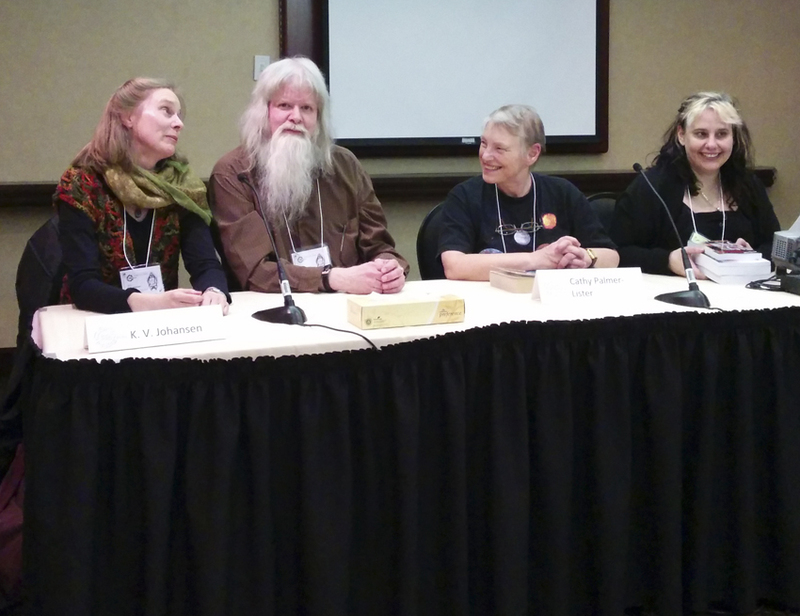 Ed Greenwood’s decades-long experience as reader, author, and librarian was definitely a vital element of this discussion. This entry was posted in sf conventions, Writing and tagged books, cover art, fantasy novels, research, sf conventions, world-building. Bookmark the permalink. Ed Greenwood was definitely the funniest panelist, and not afraid of a little risqué humour – all in good fun and to keep the crowd laughing, of course. But I wanted to hear more cover art horror stories from all the authors. I was promised there were lots! I definitely wanted to hear about that too, especially from someone with Greenwood’s many years of experience. I’ve certainly collected a few myself in the past fifteen years — the 1930’s orphan waifs I successfully protested against on the Nightwalker cover, for instance. (Though that’s all balanced by the glory and right-on-ness of Swanland’s Pyr covers.) You’ll have to blame my inexperience as a moderator that I didn’t manage to bring that question up. I’ll do better next time, now that I have a better idea of how to moderate a panel.